When we look at instrumentalists who play in an orchestra, years are spent learning, for example, the best way to position or hold a bow to artistically play a violin, viola, or cello, the best way to hold a flute, oboe, bassoon, clarinet, or [french] horn so that the player can form a proper embouchure and exercise artistic control of the instrument over its entire range, the best way to sit at a modern chromatic harp in order to play it with full control, the best way to hold and place the mallets when playing the tympani, or the best way to sit at the Queen of Instruments -- a concert grand piano -- to permit command of the entire keyboard. It is EXTREMELY important how the pianist positions the body for the sake of technique, endurance, and agility on the piano keys. The height of the piano bench, for example, must be adjusted so that, when the pianist is seated, the forearms are horizontal and at the level of the keyboard (this is made possible by means an adjustable "artists bench" having a crank mechanism, or cushions may be used); the pianist must also find the middle point of the keyboard and center the body there (middle C is NOT the center of the 88-key piano keyboard -- the center is at the middle E and F keys); the bench also has to be pulled out enough so that the elbows don't bump into the player's body when the arms move up and down the keys (this means NOT sitting with the front edge of the bench tight against the back of the knees); and when sitting erect with both arms held out straight, palms down, and the fingertips of both hands are bent down on a perpendicular, the backs of the hands should be even with the raised fallboard. THIS is the proper bench position from which to play the piano with command. Whether someone is playing the smallest harmonica or the biggest tuba, everything depends upon the correct positioning of the body. The organ, as a musical instrument, is not somehow immune to all of this. 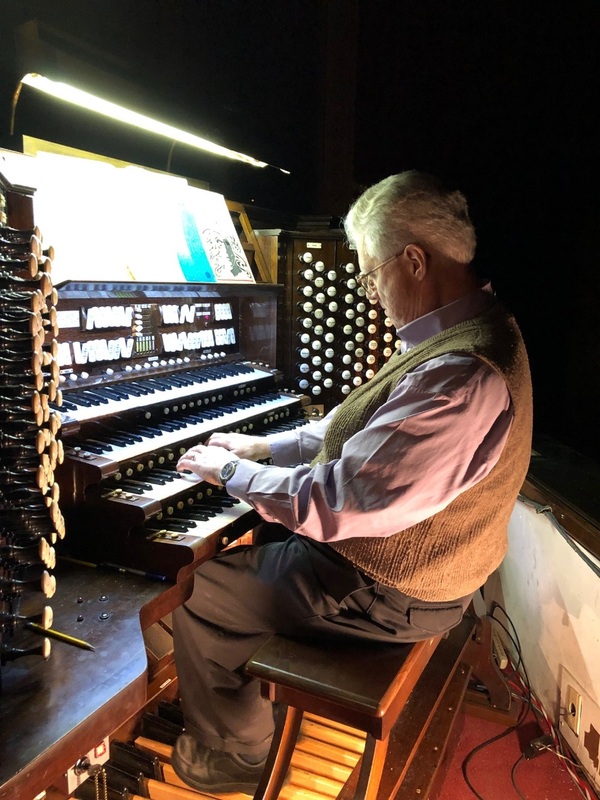 Finding someone sitting like this (photo) at a church or concert organ, or perhaps at a home practice instrument, seeming to be getting nowhere with their playing, is a more common occurrence than any of us care to admit. This player is having problems; nothing seems to be working for him; he does not have command of the instrument; his playing, to be perfectly honest, if over with before it started. And no wonder -- firstly, and most obviously, the bench is sitting way too close to the bottom manual; the organist in this photo found the bench this way when he came to practice and just sat on it and tried to start playing. Actually, he did this deliberately for the photo value to make an important point, but look what this did to him; it forced him to sit too far back on the bench, causing him to lean backward with his spine curved in a slouched position; this leads to postural fatigue, restricts the movement of the legs, and leaves insufficient room for his feet to play the pedals. Both his elbows are bumping into his body when he tries to move his arms up and down the keys; the legs also can't move freely with the edge of the bench so close to the backs of his knees; additionally, he's wearing street shoes with wide rubber soles that project -- exactly the wrong kind for organ playing [See blog, Shoes, Parts I-V]. NOTE: he also didn't bother to find the center position when he sat down to play -- he just sat down and began playing (the organ pedalboard is used to center the body; the left toe is placed on low F# and the right toe on high C#; the body is then shifted to the spot exactly between these 2 keys (directly over middle E) while the hands are bracing the weight of the body on the bench (the weight of the body is NEVER placed on the pedal keys). Being impatient and not paying attention to any of this when we sit down to play is destructive to endurance, technique, agility on the bench, and the freedom needed to play. The remedy here would be to move the bench out an inch or two, work with it a little to find the best spot, have this organist sit clear up on the edge of it, center himself, straighten his spine, and get the right shoes on his feet. THEN he'll be able to play the organ. COROLLARY: Freedom in organ playing comes by repetition and keeping good habits going. Put another way -- freedom in organ playing DOES NOT mean we can sit on the bench "any old way we want" or wear "any old thing we want" on our feet; on the contrary, enslaving ourselves to good habits and keeping them going is what sets us free to play the instrument. How we sit on the bench should NEVER be left to chance; it makes all the difference in the world in whether or not we can have command of the organ. Which is why it's NEVER a good idea to permanently fasten down the bench merely for the convenience of the principal organist; the position of the bench isn't, and never was, about what's best for one person. We have to remember that even though some organists tend to speak of the instrument over which they preside as "theirs," and they steward their responsibility over it with loving care, it nevertheless belongs to the institution; with proper care and maintenance it will far outlast the lifespan of the principal organist, whoever he or she may currently happen to be. TIP: In the above situation (photo), if the bench were pulled out about 2 inches more to where the back of the foot rail under the bench were, let's say, about even with the pedal footboard, and if, after some experimentation, this bench position worked really well for this player, then he should make a mental note of it and make sure, each time he intends to play this instrument, that the back of the foot rail of the bench and the pedal footboard were always exactly in line with each other BEFORE he climbs on the bench.